With Auto Sync, you only need to add product information once. To find the Auto sync setting, go to your store page that you can find on the sidebar under the 'Connect' section. In the 'Products' section of your store page, Click 'More' to see your Auto-sync setting. 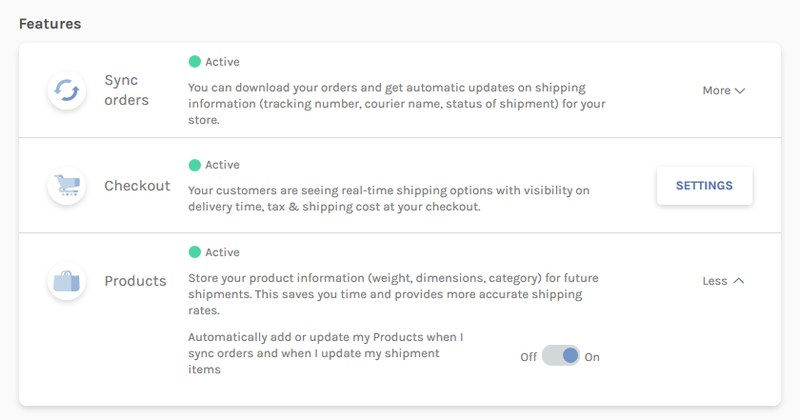 When 'Products Auto-Sync' is ON, each time you ship a new item with Easyship, its product information will automatically be saved to the Products page. If you are showing our shipping rates at the checkout page of your store, we recommend that you leave auto-sync ON, as our platform will be able to provide accurate dynamic rates until after you have shipped each item at least once. I need to have someone input all of my product data related to weight and dimensions. I have a CSV file. There is no title 'products' on the dashboard I am seeing. You can upload all your inventory via CSV file if you use our template.